As I wander through the many aspects of Pagan and magical publishing and web-sites I find a trend emerging that I entirely approve of. Many groups and individuals seem to be making a particular effort to develop contacts with those members of the Ancestors who are especially concerned with magical and religious affairs. That is, in order to begin to really learn and practice the core of ancient religion we’re working to make contact with the Wise Dead or, as we are sometimes calling them in Our Druidry, the Elder Wise. I swear we thought of it ourselves – at ADF’s first or second Clergy Retreat, when we try to get our e-mailing cohort of formal clergy into one real-life locale to do actual discussion and ritual. After years of dithering over a Clergy Training Program, we now have a growing body of actually trained folks, and so we’re thinking about what a ‘clergy order’ might consist of in a group like ours. Since we’re not limited to one Pagan culture, nor to one pantheon of Gods the question of the spiritual ‘presidency’ of such an order puzzled us for a while. What made sense was to place the order under the Ancestors, and begin a special effort to make alliances with those of the Wise Dead who might be interested in our work. There will be more about all that here over time, perhaps, though we’re keeping some of it limited to the clergy. But now that we have that work cooking a little, I’m starting to notice variants of it around the Pagan/magical scene. For instance Cherry Hill Seminary has taken up the ancient scholar and priestess Hypatia. There’s some small chance I had this in my head in the above discussion, as I had met Macha Nightmare and heard about Hypatia from her that previous summer. I’m presently working my way through an interesting book on magic called Magic That Works, by Harrison and Shadrach. It’s off-topic for this blog as a whole, since it’s based heavily on (interesting) traditions of Arabic and Hebraic magic that seldom get attention in western publications, but it’s very traditional and very detailed in its system. It includes an invocation to beings it calls the ‘Masters of Magic’. On one level these seem rather like ‘Ascended Masters’ or the like, but they are also described as human spirits, though rather mythologized. Altogether I suppose there’s a family resemblance between the idea of spiritual teachers among the Spirits and the Ascended Masters or Great White Brotherhood. The difference, at least in my mind, is that we aren’t seeking contact with superbeings, people who have ‘attained enlightenment’ or gained personal immortality. Rather we’re looking for more regular members of the Beloved Dead who just happened to be working priestesses, magicians, etc, and who will be willing to teach and guide our work. I think the growing awareness of the power of those spirits that the Celts called the ‘not-Gods’ – the Dead and the many kinds of Landwights – is manifesting. As we move toward a deeper understanding of polytheism we move past not just ‘God’ but even ‘the Gods’ to the presence of the divine in the multitude of beings. This understanding seems, to me, to be standard in the unbroken polytheist traditions – African and Asian ways, for instance. 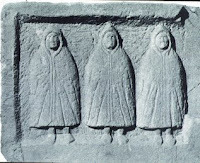 In European traditions it is obscured by the Christian distaste for contact with the Dead, but shows remnants in several Euro-Pagan systems. This approach to the Wise Dead is one of the first formal bits of Cult of the Dead that Our Druidry has undertaken. We’re beginning with our clergy membership, but I already forsee it moving into the work of clergy and initiatory students. Here’s a short charm that I intend to work into a spirit-awareness rite for my Initiate’s Book project. To the Wise Dead I call. hear me as I call to you. Let us meet at the Crossroad, at the Tree of Worlds. To you who hear me, I offer this offering. Whisper to me, Wise Ones, teach the Old Ways for New Days. Bless my work and aid me to gain from my seeking. Let the voice of the Wise be heard in the World. Elder Wise, accept my sacrifice! Hey, how are you doing? You have an amazing blog. Thank you so much. I'm a Neopagan of the Druidic sort, interested in Celtic polytheism as it might manifest for modern people in North America. I'm also an occultist, broadly interested in arcane and magical systems and ideas, from medieval grimoires through Hindu Tantra and Asian shamanism to Thelema and Chaos Magic. I'm a fan of the folk music of the British Isles and its modern inheritors as well as of fantasy and horror lit, especially the work and legacy of HP Lovecraft. My Lulu Store, Buy My Other Books etc.